Australia, India and Sri Lanka are into the one day series. And it was nothing but a boring start to the series with two abandoned contests in a row. 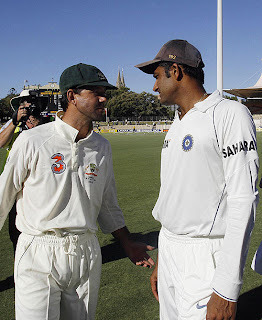 But just concluded test series between Australia and India was one of the most exciting I have seen. It was full of drama, emotion, action and whatever you could find in typical bollywood movie. 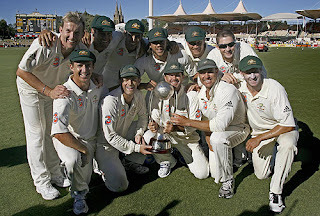 Lets discuss some of the issues there…..
Well this test series would be remembered more for the events happening off the field than on the field. Australians are infamous for bullying their opponents on the field. But this time they have tested the taste of their own medicine. This time also the issue was started by the Australians only, Bhajji just responded to them. Symonds accused Bhajji calling him ‘Monkey’ and Bhajji was saying that he called ‘Maaki’ not ‘Monkey’. It seems that Mr. Symonds was happy to be called ‘Maaki’ rather than ‘Monkey’. Well, decision came into Bhajji’s way and in my view its quite fare. Decision was given by the qualified judge and should respect that. But Australian is not happy with that decision they are accusing BCCI of using their money power to turn decision in their way. Decision was given by independent authority thus it suggest that Australians want to say that BCCI bribed judge, isn’t it??? Symond said that “People are questioning my integrity and this burns my heart.” Well people can question person’s integrity who was out atleast three times in a single inning and still continued to play (Sydney test). Gilchrist said adieu to the cricket….. 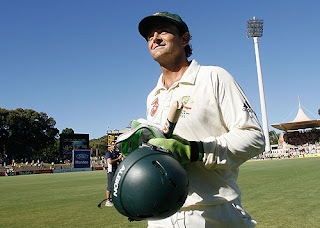 In my book Gilchrist was the all time finest wicket keeper batsman in the world. And I know many carries the similar view. It is no doubt will be great loss to the Australian team. Well, Haddin is ready there to grab the Gilchrist position which he was holding for more than decade. But, I guess other team won’t complaint much. Now, within a year or so many quality players of the Australian team has retired (Langer, McGrath, Warne) and some of them are on the verge of their retirement. So, it’s a big question in front of them weather they can hold their position of “World Champion”. Series Win for Australia but……..
Well, Australia has won the series, but win could go in the books as one of the controversial series between India and Australia ,thanks to all the controversies surrounding the Sydney test. ‘Satisfactory element’ is missing there. Well, I don’t think Australian bothers about it. For them winning was more important. Sorrow of losing the series will always be there for Indians, but there are some positive also which could be cherished. 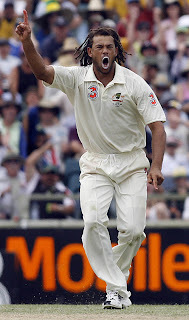 Last series of Australia gave India one fantastic bowler in ‘Irfan Phatan’ and this time we got ‘Ishaant Sharma’. 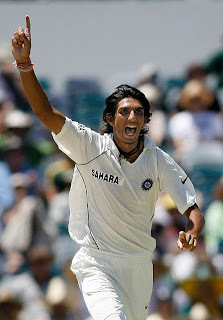 This 19 years old, lanky fast bowler has shown enough promise, and could be long term prospect for India. Another big positive was ‘Virender Sehwag’, after losing his place in the Indian side he has returned with bang. His knock in the last match of test series will give him permanent seat in the Indian team. Dhoni was little off colour. But its only matter of time for him to come to his own groove. Again the big talk after series involved Saurav Ganguly. Now there is no point in dragging this issue, selectors has made it clear that they don’t want Ganguly in the team. Ganguly should also understand this thing and should retire from one day. Now India is doing well in the ongoing one day series. It is really interesting to see how Dhoni’s young brigade face the wrath of relative more experienced Australian and Sri lankan team.